Actually, it’s really easy. Simply plug the device into your USB portand follow the on-screen instructions. 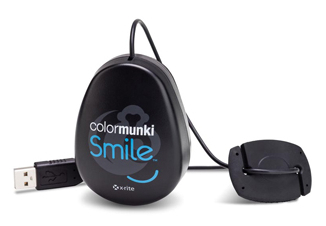 ColorMunki Smile does all the work with a few clicks of the mouse. When the process is done you’ll seebefore and after results and your new color settings automatically start working. So whether you are viewing, editing or sharing your images, you’ll know your colors are right. Even if you’re gaming or web browsing you’ll get truer colors. It couldn’t be simpler. Your colors should really match everywhere they appear. With ColorMunki Smile, now they will. Easily. Beautifully. All the time.